What can compare to the value of the Hope Diamond? It would have to be something priceless. One’s own life is certainly priceless, and so too, is a life-saving remedy. GARLIC is a life-saving remedy and a treasure in its own right! Laughable? Not if you realize that garlic can literally save and protect your life, your health. With over 400 chemical components, garlic health benefits seem endless; researchers have established that garlic is effective in preventing and treating a stupendous multitude of maladies. A natural antibiotic, garlic works against a host of dangerous bacteria such as Staphylococcus and Streptococcus, as well as against viruses, including viral meningitis, viral pneumonia, and herpes infections. It is anti-fungal and anti-yeast, and even inhibits the growth of parasites in the intestines, works against the common cold, the flu, asthma, even tuberculosis. Remarkably, it has also shown to be effective in treating HIV, atherosclerosis, stroke and certain forms of cancer. Garlic protects the body against numerous infections. It not only kills microorganisms on contact, inhibiting their growth and proliferation, but also strengthens the immune system’s ability to fight disease. Garlic increases the number of disease-fighting components of the immune system called lymphocytes, phagocytes, and natural killer T-cells. These specialized cells are enhanced by garlic to do their job. Garlic’s amazing ability to strengthen the immune system has proven to be of tremendous value in fighting the HIV virus. Garlic not only can reduce the virus’s spread in the body, but keep deadly opportunistic infections at bay. 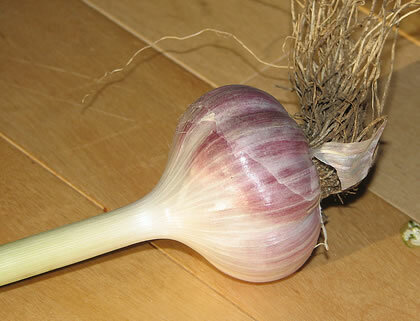 Garlic is more and more frequently being used as an adjunct treatment for HIV and AIDS patients. With one in three people predicted to contract cancer at some time in their life, it is good to know that garlic can fight the threat of malignant cells and tumorous growths from getting a foothold. Over the years, a number of experiments with animals have shown that garlic effectively inhibited the development of cancer of the esophagus, colon, skin and bladder cancers. More recently, garlic has been used with some success in treating breast cancer in women. In addition, it has been discovered that people who ate more sulphur-rich vegetables, such as cabbage, cauliflower, broccoli, leeks and onions, as well as garlic, had the least risk of contracting cancer. In one study it was found that garlic’s sulfur compounds have a powerful effect on the liver’s detoxification enzymes; it is these enzymes with which the liver breaks down and eliminates toxins. Garlic thus helps the liver to remove toxic substances and harmful chemicals from the body; this action can actually keep cells from becoming cancerous. Used since ancient times for heart ailments, today known as atherosclerosis and high blood pressure, garlic is today proven to be effective in fighting cardiovascular disease, the number one killer in the Western world. Garlic not only helps reduce cholesterol in blood vessels, but thins the blood and lowers blood pressure, all of which reduce the risk of blood clots, a heart attack or stroke. Keeping to a healthy lifestyle, eating fruits, vegetables and whole grains, restricting the intake of animal protein, and always including garlic in your diet can go a long way in reducing the risk of heart disease. The host of the TV health show, Dr. Oz, once remarked to a woman who liked to eat a lot of garlic, “You’re probably the healthiest person in this audience!” That comment speaks from a knowledge and faith in this herb by a medical professional who understands the power of garlic to protect our health. For its life-preserving value, garlic, indeed, is a natural treasure on a par with any million-dollar gem! Garlic is really a wonderful and life saving medicine and one should take daily atleast two to three cloves in the morning preferably with lime(lemon) water to make oneself fit all the day. Garlic acts as a blood thinner and save from the heart-attack and stroke in case it is used daily i.e two to three choped cloves with water. It is also called magic drug and one should take for the benefit of one’s health.